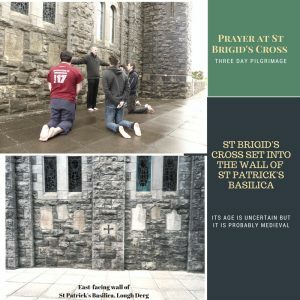 St Brigid’s Cross is a deeply incised stone cross set in the outside wall of the basilica. Making the Station Prayer pilgrims kneel here to pray 3 Our Fathers, 3 Hail Mary’s and the Apostles’ Creed. Then standing with arms outstretched in the shape of a cross the pilgrim three times declares: I renounce the world, the flesh and the devil. This declaration has the echo of our baptismal promises. The terms “world” and “flesh” here, taken respectively from St Paul and St John, have the scriptural meaning of all that opposes itself to the life of the Spirit. Brigid in her lifetime renounced her social standing to put herself at the service of the poor and the disadvantaged. 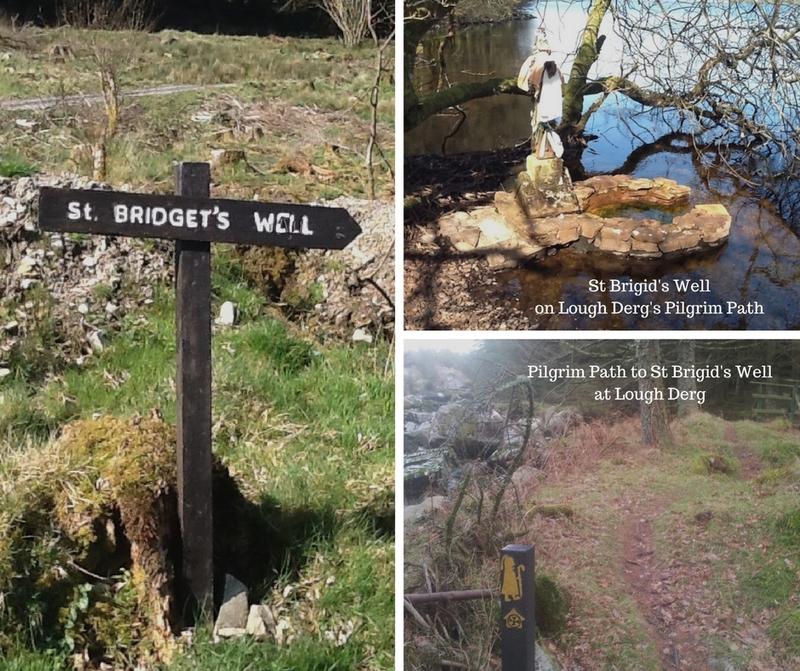 As seasoned Three-Day pilgrims know so well, the first of the six penitential beds is named for St Brigid. In making the Station Prayer, St Brigid’s Bed happens to be possibly the most challenging one! Brigid is depicted in the right panel of the rather lovely three-light stained glass window by the Earley Studio in the chancel of St Mary’s Chapel. 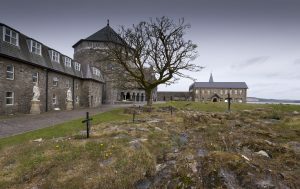 She is shown with branches of the oak – a reference to her famous monastery at Kildare – the Cell of the Oak Tree. On the mainland, the small chapel in the visitor centre is dedicated to St Brigid, and one of the variety of forms of St Brigid’s cross, traditionally woven from rushes or other natural materials, is taken up in the bronze cross high above the altar. 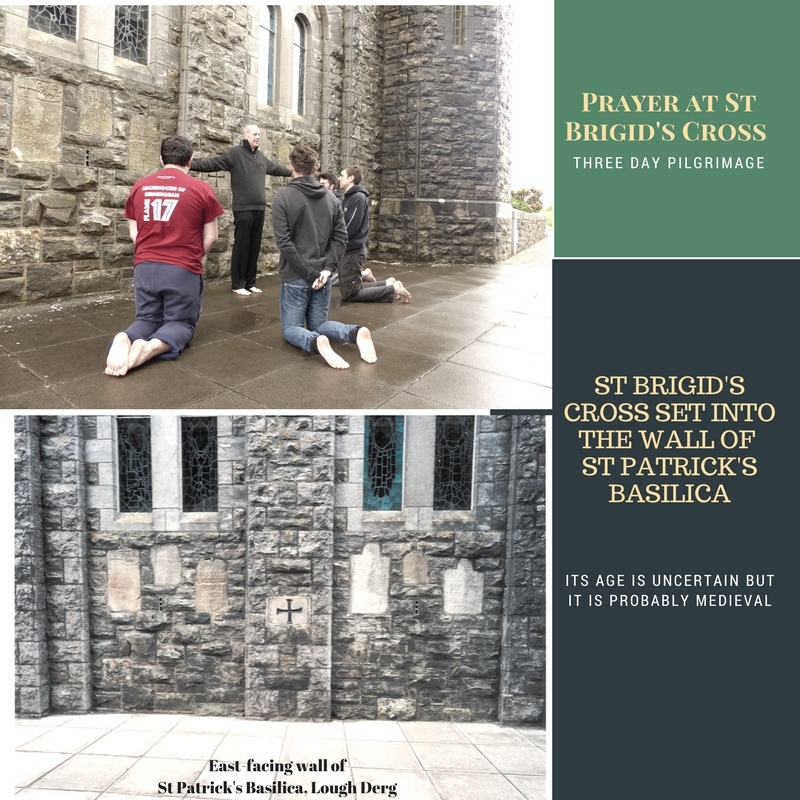 The story goes that visiting a poor man who lay dying, Brigid picked up some of the rushes strewn on the cabin floor to weave a cross and speak to him about Jesus who died for him. On the lakeshore, just a little way along the Pilgrim Path, can be seen the great boulder traditionally known from its suggestive shape as St Brigid’s Chair. 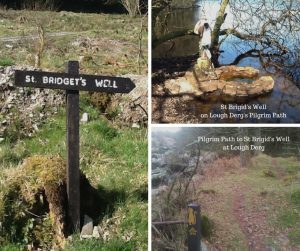 In earlier times, this gave rise to a delightful legend that Brigid herself rested here as she waited for a boat to bring her across to Station Island! Strong in charity, cure and care.